A few months back my mom sent me this picture she found on Pinterest with a text that said: “Please make me one of these!” It’s a rare event that she requests something like this, so I decided I had to make one ASAP. 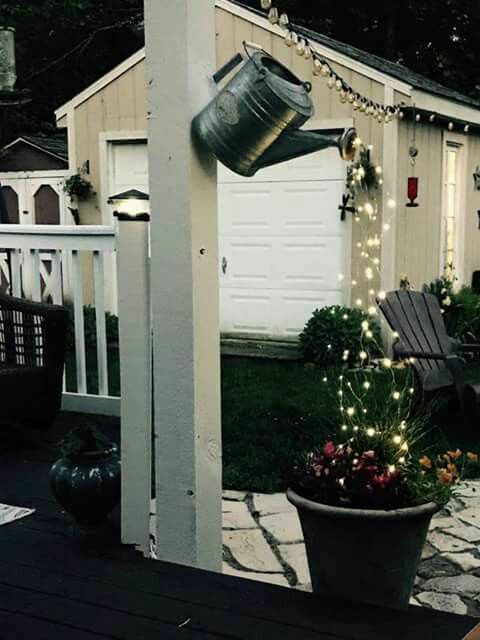 The inspiration photo she sent me looked simple enough– a watering can hanging from a porch with a strand of lights dripping out of the faucet into the plant container below. Your wish is my command, mama! How cute is this idea? 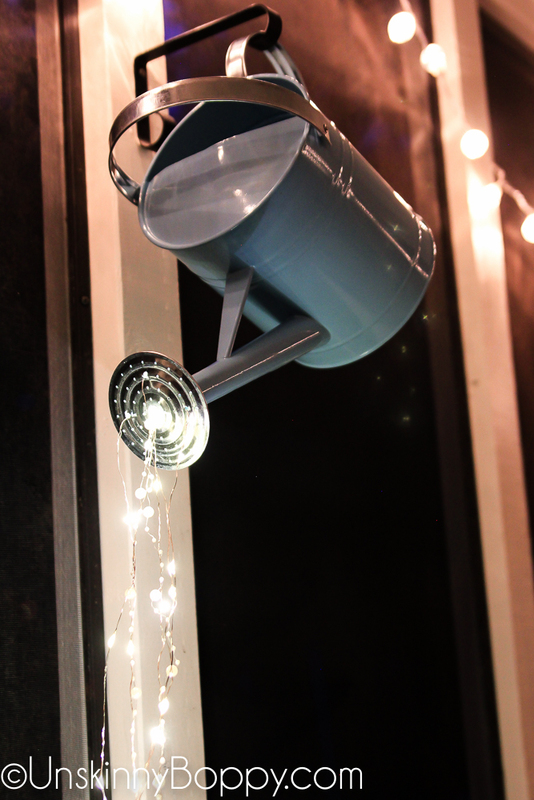 So, for Mother’s Day this year, I made my mom one of these watering cans with fairy lights “pouring” out of it. This turned out to be a simple little project that you can make in less than an hour if you have the right supplies. I loved it so much that I bought enough supplies to make two– one for her and one for my new back porch! Unscrew the end of the watering can spout and set aside. Put battery powered fairy lights inside the can and run the strings out through the end of the spout. Using a large drill bit, drill multiple large holes around the end of the spigot. Make sure the holes are large enough for the lights to fit through. My lights had pearls attached to them so we had to drill larger holes for the pearls. Snip off any sharp excess metal edges. Feed the lights through the holes. You might have to loop them up and back out again depending on the length of your light strings. 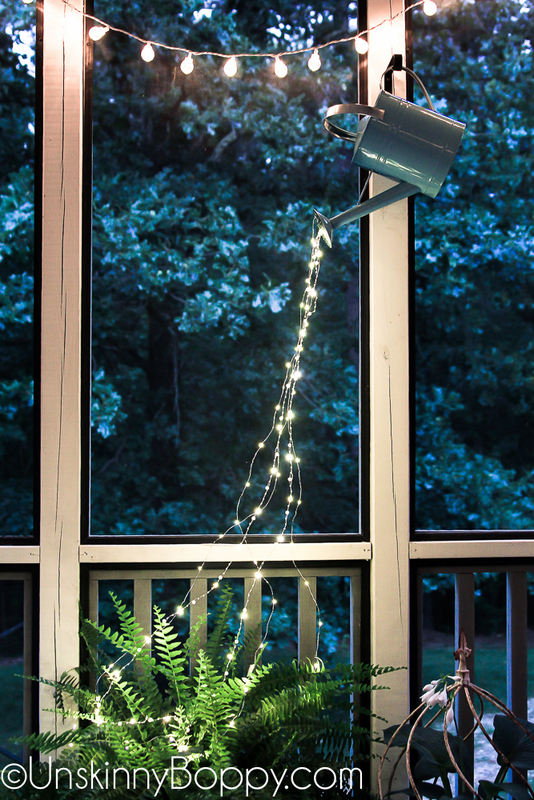 Hang the can from a high hanger and position it over a plant in your garden so the lights “pour” over the plant at night. Works best in a spot that will not receive any rain, such as a covered porch or indoors. And there you go! That’s all there is to make this fun and easy gardening project. 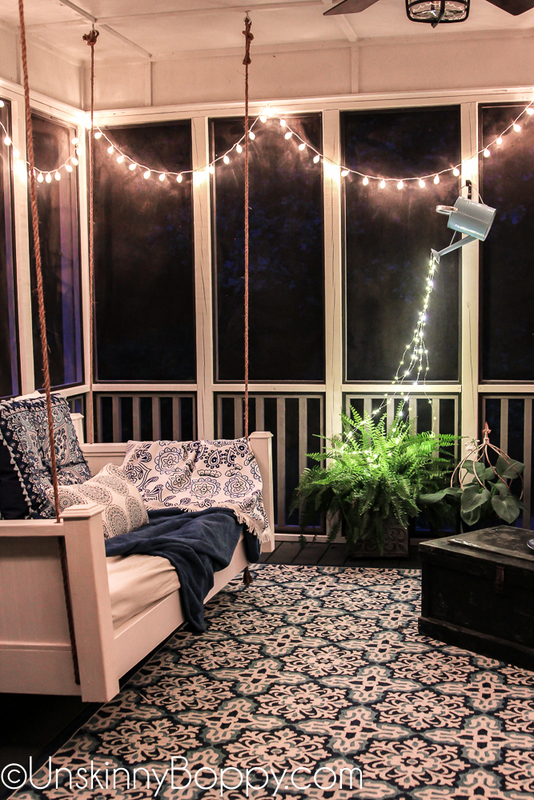 Isn’t this the most beautiful addition to the screened-in back porch makeover? I heart it. This porch is 100% my new favorite spot in our house. During the day it’s shady and cool under the ceiling fan. When it’s a dreary day outside it’s the perfect place to listen to the rain pattering on the roof. It is such a cozy spot at night when the lights are dim and the crickets are chirping. We have spent every single evening this spring enjoying this porch. It’s like the coziest spot on Earth. 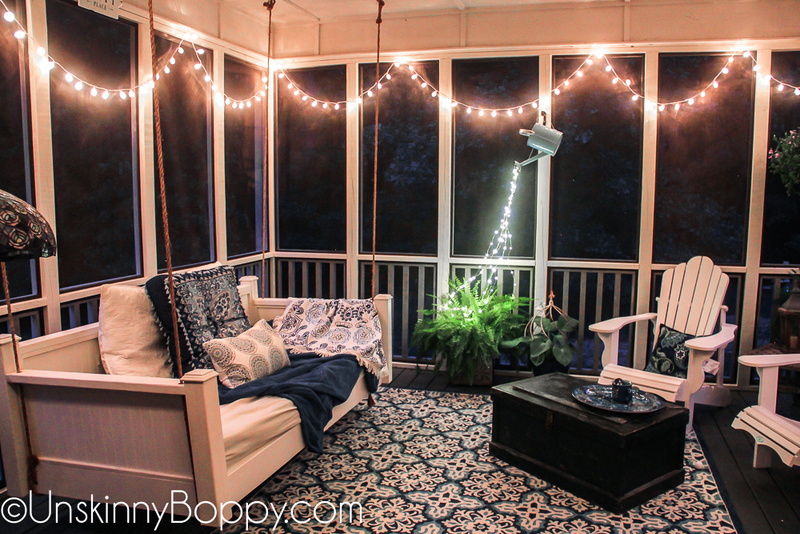 To see the back porch in daylight after the makeover, click here. If you have a gardener in your life who needs a cute gift, I hope you’ll give this easy DIY project a whirl. If you do try this out, please send me some pics of your project! I’d love to see what you guys come up with. It’s beautuful! It adds so much to your new porch decorations, too! I’ll semd you any other beauties I find. This is really a cute idea. Well done! I love lights for other seasons and decor off the floor is so much harder to come by! Thanks Emily! 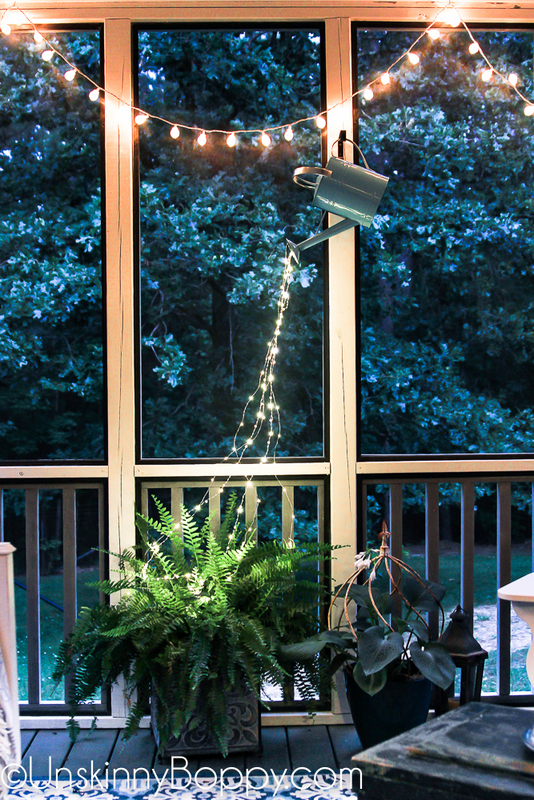 I’m a huge fan of outdoor lights all year round, so this little project was perfect for the porch! Cute and clever idea. I’m sure your mom loved it! On another note, I loved Megan’s gown as well as yours but I’ll bet you didn’t pay $270,000 for yours! lol Yours looks exactly like Megan’s and both were just just stunning. Thanks Nita! And you would be correct- my wedding dress cost a fraction of hers but I loved it just as much. 🙂 Thanks for your sweet compliments. Hey Karen, I got the can at Big Lots a few months ago. It’s not very big- maybe about 12″ tall? Good luck with your project. I used two strands of lights that were about 10′ long each. Hello! I’m from the Birmingham area as well! 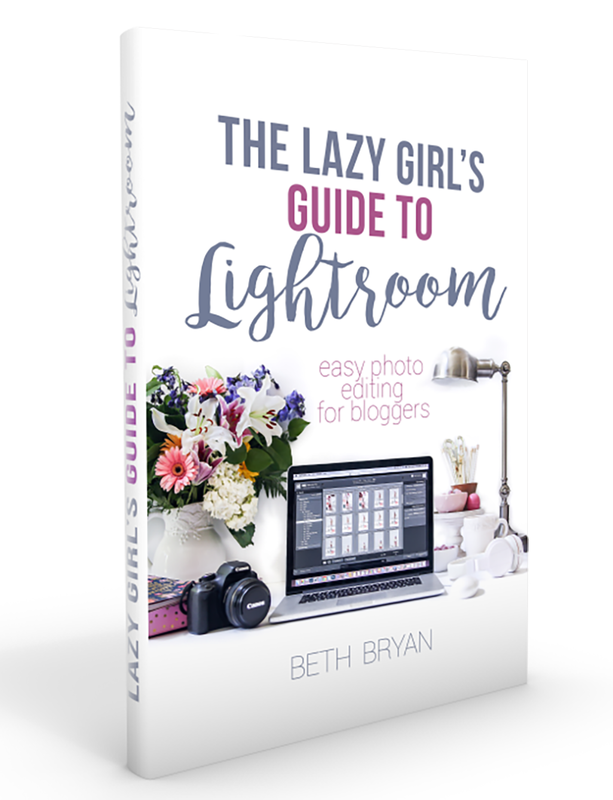 I found your blog and have been so enjoying it. Love all of the DIYs and décor posts. Hey Leanne! I’m so glad you found me. It’s always fun to hear from local folks. 🙂 I hope you will pin anything that inspires you and stick around for more ideas to come. Have a great Memorial Day!